Cast iron feature in need of cleaning and painting. Photo: Courtesy, New York Landmarks Conservancy. The preservation of cast-iron architectural elements, including entire facades, has gained increasing attention in recent years as commercial districts are recognized for their historic significance and revitalized. This Brief provides general guidance on approaches to the preservation and restoration of historic cast iron. 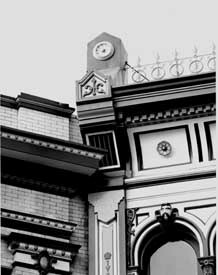 This shows a detail of a polychromed cast-iron facade in Petaluma, California, 1886 (O'Connell and Lewis, Architectural Iron Works, San Francisco). Photo: Don Meacham. Cast iron played a pre-eminent role in the industrial development of our country during the 19th century. Cast-iron machinery filled America's factories and made possible the growth of railroad transportation. Cast iron was used extensively in our cities for water systems and street lighting. As an architectural metal, it made possible bold new advances in architectural designs and building technology, while providing a richness in ornamentation. This age-old metal, an iron alloy with a high carbon content, had been too costly to make in large quantities until the mid-18th century, when new furnace technology in England made it more economical for use in construction. Known for its great strength in compression, cast iron in the form of slender, nonflammable pillars, was introduced in the 1790s in English cotton mills, where fires were endemic. In the United States, similar thin columns were first employed in the 1820s in theaters and churches to support balconies. By the mid-1820's, one-story iron storefronts were being advertised in New York City. 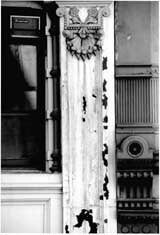 Daniel Badger, the Boston foundryman who later moved to New York, asserted that in 1842 he fabricated and installed the first rolling iron shutters for iron storefronts, which provided protection against theft and external fire. In the years ahead, and into the 1920s, the practical cast-iron storefront would become a favorite in towns and cities from coast to coast. Not only did it help support the load of the upper floors, but it provided large show windows for the display of wares and allowed natural light to flood the interiors of the shops. Most importantly, cast-iron storefronts were inexpensive to assemble, requiring little onsite labor. A tireless advocate for the use of cast iron in buildings was an inventive New Yorker, the self-taught architect/engineer James Bogardus. From 1840 on, Bogardus extolled its virtues of strength, structural stability, durability, relative lightness, ability to be cast in almost any shape and, above all, the fire-resistant qualities so sought after in an age of serious urban conflagrations. He also stressed that the foundry casting processes, by which cast iron was made into building elements, were thoroughly compatible with the new concepts of prefabrication, mass production, and use of identical interchangeable parts. In 1849 Bogardus created something uniquely American when he erected the first structure with self-supporting, multi-storied exterior walls of iron. Known as the Edgar Laing Stores, this corner row of small four-story warehouses that looked like one building was constructed in lower Manhattan in only two months. Its rear, side, and interior bearing walls were of brick; the floor framing consisted of timber joists and girders. One of the cast-iron walls was load-bearing, supporting the wood floor joists. The innovation was its two street facades of self-supporting cast iron, consisting of multiples of only a few pieces—Doric-style engaged columns, panels, sills, and plates, along with some applied ornaments. Each component of the facades had been cast individually in a sand mold in a foundry, machined smooth, tested for fit, and finally trundled on horse-drawn drays to the building site. There they were hoisted into position, then bolted together and fastened to the conventional structure of timber and brick with iron spikes and straps. 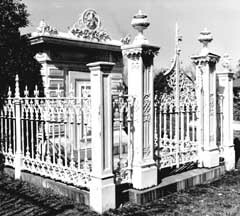 The Slatter Family Tomb in Mobile, Alabama, consisting of a cast-iron mausoleum and fence, exhibits the wide range of uses of the material in the 19th century. Photo: Jack E. Boucher, HABS Collection. The second iron-front building erected was a quantum leap beyond the Laing Stores in size and complexity. Begun in April 1850 by Bogardus, with architect Robert Hatfield, the five-story Sun newspaper building in Baltimore was both cast-iron-fronted and cast-iron-framed. In Philadelphia, several iron-fronts were begun in 1850: The Inquirer Building, the Brock Stores, and the Penn Mutuai Building (all three have been demolished). 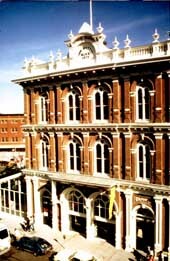 The St. Charles Hotel of 1851 at 60 N. Third Street is the oldest iron-front in America. Framing with cast-iron columns and wrought-iron beams and trusses was visible on a vast scale in the New York Crystal Palace of 1853. In the second half of the 19th century, the United States was in an era of tremendous economic and territorial growth. The use of iron in commercial and public buildings spread rapidly, and hundreds of iron-fronted buildings were erected in cities across the country from 1849 to beyond the turn of the century. Outstanding examples of iron-fronts exist in Baltimore, Galveston, Louisville, Milwaukee, New Orleans, Philadelphia, Richmond, Rochester (N.Y.), and especially New York City where the SoHo Cast Iron Historic District alone has 139 iron-fronted buildings. Regrettably, a large proportion of iron-fronts nationwide have been demolished in downtown redevelopment projects, especially since World War II. In addition to these exterior uses, many public buildings display magnificent exposed interior ironwork, at once ornamental and structural. Remarkable examples have survived across the country, including the Peabody Library in Baltimore; the Old Executive Office Building in Washington, D.C.; the Bradbury Building in Los Angeles; the former Louisiana State Capitol; the former City Hall in Richmond; Tweed Courthouse in New York; and the state capitols of California, Georgia, Michigan, Tennessee, and Texas. And it is iron, of course, that forms the great dome of the United States Capitol, completed during the Civil War. Ornamental cast iron was a popular material in the landscape as well, appearing as fences, fountains with statuary, lampposts, furniture, urns, gazebos, gates, and enclosures for cemetery plots. With such widespread demand, many American foundries that had been casting machine parts, bank safes, iron pipe, or cookstoves added architectural iron departments. These called for patternmakers with sophisticated design capabilities, as well as knowledge of metal shrinkage and other technical aspects of casting. Major companies included the Hayward Bartlett Co. in Baltimore; James L. Jackson, Cornell Brothers, J. L. Mott, and Daniel D. Badger's Architectural Iron Works in Manhattan; Hecla Ironworks in Brooklyn; Wood and Perot of Philadelphia; Leeds and Co., the Shakspeare (sic) Foundry, and Miltenberger in New Orleans; Winslow Brothers in Chicago; and James McKinney in Albany, N.Y. Cast iron was the metal of choice throughout the second half of the 19th century. Not only was it a fire-resistant material in a period of major urban fires, but also large facades could be produced with cast iron at less cost than comparable stone fronts, and iron buildings could be erected with speed and efficiency. The largest standing example of framing with cast-iron columns and wrought-iron beams is Chicago's sixteen-story Manhattan Building, the world's tallest skyscraper when built in 1890 by William LeBaron Jenney. By this time, however, steel was becoming available nationally, and was structurally more versatile and cost-competitive. Its increased use is one reason why building with cast iron diminished around the turn of the century after having been so eagerly adopted only fifty years before. Nonetheless, cast iron continued to be used in substantial quantities for many other structural and ornamental purposes well into the 20th century: storefronts; marquees; bays and large window frames for steel-framed, masonry-clad buildings; and street and landscape furnishings, including subway kiosks. The 19th century left us with a rich heritage of new building methods, especially construction on an altogether new scale that was made possible by the use of metals. Of these, cast iron was the pioneer, although its period of intensive use lasted but a half century. Now the surviving legacy of cast-iron architecture, much of which continues to be threatened, merits renewed appreciation and appropriate preservation and restoration treatments. Cast iron is an alloy with a high carbon content (at least 1.7% and usually 3.0 to 3.7%) that makes it more resistant to corrosion than either wrought iron or steel. In addition to carbon, cast iron contains varying amounts of silicon, sulfur, manganese, and phosphorus. While molten, cast iron is easily poured into molds, making it possible to create nearly unlimited decorative and structural forms. Unlike wrought iron and steel, cast iron is too hard and brittle to be shaped by hammering, rolling, or pressing. However, because it is more rigid and more resistant to buckling than other forms of iron, it can withstand great compression loads. Cast iron is relatively weak in tension, however and fails under tensile loading with little prior warning. 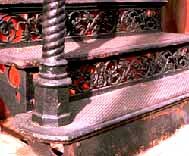 The risers on these cast iron steps feature a highly decorative pattern. Photo: NPS files. The characteristics of various types of cast iron are determined by their composition and the techniques used in melting, casting, and heat treatment. Metallurgical constituents of cast iron that affect its brittleness, toughness, and strength include ferrite, cementite, pearlite, and graphite carbon. Cast iron with flakes of carbon is called gray cast iron. The "gray fracture" associated with cast iron was probably named for the gray, grainy appearance of its broken edge caused by the presence of flakes of free graphite, which account for the brittleness of cast iron. This brittleness is the important distinguishing characteristic between cast iron and mild steel. Compared with cast iron, wrought iron is relatively soft, malleable, tough, fatigue-resistant, and readily worked by forging, bending, and drawing. It is almost pure iron, with less than 1% (usually 0.02 to 0.03%) carbon. Slag varies between 1% and 4% of its content and exists in a purely physical association, that is, it is not alloyed. This gives wrought iron its characteristic laminated (layered) or fibrous structure. Wrought iron can be distinguished from cast iron in several ways. Wrought-iron elements generally are simpler in form and less uniform in appearance than cast-iron elements, and contain evidence of rolling or hand working. Cast iron often contains mold lines, flashing, casting flaws, and air holes. Cast-iron elements are very uniform in appearance and are frequently used repetitively. Cast-iron elements are often bolted or screwed together, whereas wrought-iron pieces are either riveted or forge-molded (heat welded) together. Mild steel is now used to fabricate new hand-worked metal work and to repair old wrought-iron elements. Mild steel is an alloy of iron and is not more than 2% carbon, which is strong but easily worked in block or ingot form. Mild steel is not as resistant to corrosion as either wrought iron or cast iron. Many of the maintenance and repair techniques described in the Brief, particularly those relating to cleaning and painting, are potentially dangerous and should be carried out only by experienced and qualified workmen using protective equipment suitable to the task. In all but the most simple repairs, it is best to involve a preservation architect or building conservator to assess the condition of the iron and prepare contract documents for its treatment. As with any preservation project, the work must be preceded by a review of local building codes and environmental protection regulations to determine whether any conflicts exist with the proposed treatments. If there are conflicts, particularly with cleaning techniques or painting materials, then waivers or variances need to be negotiated, or alternative treatments or materials adopted. Common problems encountered today with cast-iron construction include badly rusted or missing elements, impact damage, structural failures, broken joints, damage to connections, and loss of anchorage in masonry. Oxidation, or rusting, occurs rapidly when cast iron is exposed to moisture and air. The minimum relative humidity necessary to promote rusting is 65%, but this figure can be lower in the presence of corrosive agents, such as sea water, salt air, acids, acid precipitation, soils, and some sulfur compounds present in the atmosphere, which act as catalysts in the oxidation process. Rusting is accelerated in situations where architectural details provide pockets or crevices to trap and hold liquid corrosive agents. Furthermore, once a rust film forms, its porous surface acts as a reservoir for liquids, which in turn causes further corrosion. If this process is not arrested, it will continue until the iron is entirely consumed by corrosion, leaving nothing but rust. Structural crack, gaps at joints between components, and a large opening where part of the console bracket is missing are the problems evident in this cast-iron assembly. Photo: Ford, Powell & Carson. Galvanic corrosion is an electrochemical action that results when two dissimilar metals react together in the presence of an electrolyte, such as water containing salts or hydrogen ions. The severity of the galvanic corrosion is based on the difference in potential between the two metals, their relative surface areas, and time. If the more noble metal (higher position in electrochemical series) is much larger in area than the baser, or less noble, metal, the deterioration of the baser metal will be more rapid and severe. If the more noble metal is much smaller in area than the baser metal, the deterioration of the baser metal will be much less significant. Cast iron will be attacked and corroded when it is adjacent to more noble metals such as lead or copper. Graphitization of cast iron, a less common problem, occurs in the presence of acid precipitation or seawater. As the iron corrodes, the porous graphite (soft carbon) corrosion residue is impregnated with insoluble corrosion products. As a result, the cast-iron element retains its appearance and shape but is weaker structurally. 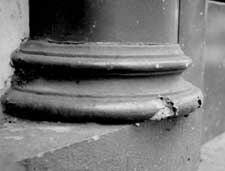 Graphitization occurs where cast iron is left unpainted for long periods or where caulked joints have failed and acidic rainwater has corroded pieces from the backside. Testing and identification of graphitization is accomplished by scraping through the surface with a knife to reveal the crumbling of the iron beneath. Where extensive graphitization occurs, usually the only solution is replacement of the damaged element. Castings may also be fractured or flawed as a result of imperfections in the original manufacturing process, such as air holes, cracks, and cinders, or cold shuts (caused by the "freezing" of the surface of the molten iron during casting because of improper or interrupted pouring). Brittleness is another problem occasionally found in old cast-iron elements. It may be a result of excessive phosphorus in the iron, or of chilling during the casting process. Before establishing the appropriate treatment for cast-iron elements in a building or structure, an evaluation should be made of the property's historical and architectural significance and alterations, along with its present condition. If the work involves more than routine maintenance, a qualified professional should be engaged to develop a historic structure report which sets forth the historical development of the property, documents its existing condition, identifies problems of repair, and provides a detailed listing of recommended work items with priorities. Through this process the significance and condition of the cast iron can be evaluated and appropriate treatments proposed. For fences, or for single components of a building such as a facade, a similar but less extensive analytical procedure should be followed. The nature and extent of the problems with the cast-iron elements must be well understood before proceeding with work. If the problems are minor, such as surface corrosion, flaking paint, and failed caulking, the property owner may be able to undertake the repairs by working directly with a knowledgeable contractor. If there are major problems or extensive damage to the cast iron, it is best to secure the services of an architect or conservator who specializes in the conservation of historic buildings. Depending on the scope of work, contract documents can range from outline specifications to complete working drawings with annotated photographs and specifications. To thoroughly assess the condition of the ironwork, a close physical inspection must be undertaken of every section of the iron construction including bolts, fasteners, and brackets. Typically, scaffolding or a mechanical lift is employed for close inspection of a cast-iron facade or other large structures. Removal of select areas of paint may be the only means to determine the exact condition of connections, metal fasteners, and intersections or crevices that might trap water. An investigation of load-bearing elements, such as columns and beams, will establish whether these components are performing as they were originally designed, or the stress patterns have been redistributed. Areas that are abnormally stressed must be examined to ascertain whether they have suffered damage or have been displaced. Damage to a primary structural member is obviously critical to identify and evaluate; attention should not be given only to decorative features. The condition of the building, structure, or object; diagnosis of its problems; and recommendations for its repair should be recorded by drawings, photographs, and written descriptions, to aid those who will be responsible for its conservation in the future. Whether minor or major work is required, the retention and repair of historic ironwork is the recommended preservation approach over replacement. All repairs and restoration work should be reversible, when possible, so that modifications or treatments that may turn out to be harmful to the long-term preservation of the iron can be corrected with the least amount of damage to the historic ironwork. Where chemical paint stripping is involved, careful planning of the sequence of work and inspection by an architect or conservator to ensure strict compliance with the contract documents is important to minimize the risk of problems. Photo: Raymond M. Pepi, Building Conservation Associates. When there is extensive failure of the protective coating and/or when heavy corrosion exists, the rust and most or all of the paint must be removed to prepare the surfaces for new protective coatings. The techniques available range from physical processes, such as wire brushing and grit blasting, to flame cleaning and chemical methods. The selection of an appropriate technique depends upon how much paint failure and corrosion has occurred, the fineness of the surface detailing, and the type of new protective coating to be applied. Local environmental regulations may restrict the options for cleaning and paint removal methods, as well as the disposal of materials. Many of these techniques are potentially dangerous and should be carried out only by experienced and qualified workers using proper eye protection, protective clothing, and other workplace safety conditions. Before selecting a process, test panels should be prepared on the iron to be cleaned to determine the relative effectiveness of various techniques. The cleaning process will most likely expose additional coating defects, cracks, and corrosion that have not been obvious before. There are a number of techniques that can be used to remove paint and corrosion from cast iron: Hand scraping, chipping, and wire brushing are the most common and least expensive methods of removing paint and light rust from cast iron. However, they do not remove all corrosion or paint as effectively as other methods. Experienced craftsmen should carry out the work to reduce the likelihood that surfaces may be scored or fragile detail damaged. Low-pressure grit blasting (commonly called abrasive cleaning or sandblasting) is often the most effective approach to removing excessive paint buildup or substantial corrosion. Grit blasting is fast, thorough, and economical, and it allows the iron to be cleaned in place. The aggregate can be iron slag or sand; copper slag should not be used on iron because of the potential for electrolytic reactions. Some sharpness in the aggregate is beneficial in that it gives the metal surface a "tooth" that will result in better paint adhesion. The use of a very sharp or hard aggregate and/or excessively high pressure (over 100 pounds per square inch) is unnecessary and should be avoided. Adjacent materials, such as brick, stone, wood, and glass, must be protected to prevent damage. Some local building codes and environmental authorities prohibit or limit dry sandblasting because of the problem of airborne dust. Wet sandblasting is more problematic than dry sandblasting for cleaning cast iron because the water will cause instantaneous surface rusting and will penetrate deep into open joints. Therefore, it is generally not considered an effective technique. Wet sandblasting reduces the amount of airborne dust when removing a heavy paint buildup, but disposal of effluent containing lead or other toxic substances is restricted by environmental regulations in most areas. Flame cleaning of rust from metal with a special multi-flame head oxyacetylene torch requires specially skilled operators, and is expensive and potentially dangerous. However, it can be very effective on lightly to moderately corroded iron. Wire brushing is usually necessary to finish the surface after flame cleaning. Chemical rust removal, by acid pickling, is an effective method of removing rust from iron elements that can be easily removed and taken to a shop for submerging in vats of dilute phosphoric or sulfuric acid. This method does not damage the surface of iron, providing that the iron is neutralized to pH level 7 after cleaning. Other chemical rust removal agents include ammonium citrate, oxalic acid, or hydrochloric acid-based products. Chemical paint removal using alkaline compounds, such as methylene chloride or potassium hydroxide, can be an effective alternative to abrasive blasting for removal of heavy paint buildup. These agents are often available as slow-acting gels or pastes. Because they can cause burns, protective clothing and eye protection must be worn. Chemicals applied to a non-watertight facade can seep through crevices and holes, resulting in damage to the building's interior finishes and corrosion to the backside of the iron components. If not thoroughly neutralized, residual traces of cleaning compounds on the surface of the iron can cause paint failures in the future. For these reasons, field application of alkaline paint removers and acidic cleaners is not generally recommended. Following any of these methods of cleaning and paint removal, the newly cleaned iron should be painted immediately with a corrosion-inhibiting primer before new rust begins to form. This time period may vary from minutes to hours depending on environmental conditions. If priming is delayed, any surface rust that has developed should be removed with a clean wire brush just before priming, because the rust prevents good bonding between the primer and the cast-iron surface and prevents the primer from completely filling the pores of the metal. The most common and effective way to preserve architectural cast iron is to maintain a protective coating of paint on the metal. Paint can also be decorative, where historically appropriate. Before removing paint from historic architectural cast iron, a microscopic analysis of samples of the historic paint sequencing is recommended. Called paint seriation analysis, this process must be carried out by an experienced architectural conservator. The analysis will identify the historic paint colors, and other conditions, such as whether the paint was matte or gloss, whether sand was added to the paint for texture, and whether the building was polychromed or marbleized. Traditionally, many cast-iron elements were painted to resemble other materials, such as limestone or sandstone. Occasionally, features were faux-painted so that the iron appeared to be veined marble. On this building, a strong alkaline paint remover was used, and apparently was not adequately rinsed or neutralized. Over a period of months, the newly applied paint began to peel and streaks of rust appeared on the iron. Photo: Kim Lovejoy. Thorough surface preparation is necessary for the adhesion of new protective coatings. All loose, flaking, and deteriorated paint must be removed from the iron, as well as dirt and mud, water-soluble salts, oil, and grease. Old paint that is tightly adhered may be left on the surface of the iron if it is compatible with the proposed coatings. The retention of old paint also preserves the historic paint sequence of the building and avoids the hazards of removal and disposal of old lead paint. It is advisable to consult manufacturer's specifications or technical representatives to ensure compatibility between the surface conditions, primer and finish coats, and application methods. For the paint to adhere properly, the metal surfaces must be absolutely dry before painting. Unless the paint selected is specifically designed for exceptional conditions, painting should not take place when the temperature is expected to fall below 50 degrees Fahrenheit within 24 hours or when the relative humidity is above 80 per cent; paint should not be applied when there is fog, mist, or rain in the air. Poorly prepared surfaces will cause the failure of even the best paints, while even moderately priced paints can be effective if applied over well-prepared surfaces. The types of paints available for protecting iron have changed dramatically in recent years due to federal, state, and local regulations that prohibit or restrict the manufacture and use of products containing toxic substances such as lead and zinc chromate, as well as volatile organic compounds and substances (VOC or VOS). Availability of paint types varies from state to state, and manufacturers continue to change product formulations to comply with new regulations. Traditionally, red lead has been used as an anticorrosive pigment for priming iron. Red lead has a strong affinity for linseed oil and forms lead soaps, which become a tough and elastic film impervious to water that is highly effective as a protective coating for iron. At least two slow-drying linseed oil-based finish coats have traditionally been used over a red lead primer, and this combination is effective on old or partially deteriorated surfaces. Today, in most areas, the use of paints containing lead is prohibited, except for some commercial and industrial purposes. Today, alkyd paints are very widely used and have largely replaced lead-containing linseed oil paints. They dry faster than oil paint, with a thinner film, but they do not protect the metal as long. Alkyd rust-inhibitive primers contain pigments such as iron oxide, zinc oxide, and zinc phosphate. These primers are suitable for previously painted surfaces cleaned by hand tools. At least two coats of primer should be applied, followed by alkyd enamel finish coats. Latex and other water-based paints are not recommended for use as primers on cast iron because they cause immediate oxidation if applied on bare metal. Vinyl acrylic latex or acrylic latex paints may be used as finish coats over alkyd rust-inhibitive primers, but if the primer coats are imperfectly applied or are damaged, the latex paint will cause oxidation of the iron. Therefore, alkyd finish coats are recommended. High-performance coatings, such as zinc-rich primers containing zinc dust, and modern epoxy coatings, can be used on cast iron to provide longer-lasting protection. These coatings typically require highly clean surfaces and special application conditions which can be difficult to achieve in the field on large buildings. These coatings are used most effectively on elements which have been removed to a shop, or newly cast iron. One particularly effective system has been first to coat commercially blast-cleaned iron with a zinc-rich primer, followed by an epoxy base coat, and two urethane finish coats. Some epoxy coatings can be used as primers on clean metal or applied to previously-painted surfaces in sound condition. Epoxies are particularly susceptible to degradation under ultraviolet radiation and must be protected by finish coats which are more resistant. There have been problems with epoxy paints which have been shop-applied to iron where the coatings have been nicked prior to installation. Field touching-up of epoxy paints is very difficult, if not impossible. This is a concern since iron exposed by imperfections in the base coat will be more likely to rust and more frequent maintenance will be required. A key factor to take into account in selection of coatings is the variety of conditions on existing and new materials on a particular building or structure. One primer may be needed for surfaces with existing paint; another for newly cast, chemically stripped, or blast-cleaned cast iron; and a third for flashings or substitute materials; all three followed by compatible finish coats. Brushing is the traditional and most effective technique for applying paint to cast iron. It provides good contact between the paint and the iron, as well as the effective filling of pits, cracks, and other blemishes in the metal. The use of spray guns to apply paint is economical, but does not always produce adequate and uniform coverage. For best results, airless sprayers should be used by skilled operators. To fully cover fine detailing and reach recesses, spraying of the primer coat, used in conjunction with brushing, may be effective. Rollers should never be used for primer coat applications on metal, and are effective for subsequent coats only on large, flat areas. The appearance of spray-applied and roller-applied finish coats is not historically appropriate and should be avoided on areas such as storefronts which are viewed close at hand. In an effort to repair the stair railing, concrete was poured around the wood spacer inside the railing ceiling. Water penetrated the railing and reacted with the concrete to accelerate the corrosion of the iron. Photo: John G. Waite. Most architectural cast iron is made of many small castings assembled by bolts or screws. Joints between pieces were caulked to prevent water from seeping in and causing rusting from the inside out. Historically, the seams were often caulked with white lead paste and sometimes backed with cotton or hemp rope; even the bolt and screw heads were caulked to protect them from the elements and to hide them from view. Although old caulking is sometimes found in good condition, it is typically crumbled from weathering, cracked from the structural settlement, or destroyed by mechanical cleaning. It is essential to replace deteriorated caulking to prevent water penetration. For good adhesion and performance, an architectural-grade polyurethane sealant or traditional white lead paste is preferred. 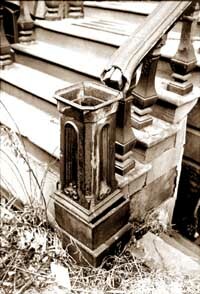 Water that penetrates the hollow parts of a cast-iron architectural element causes rust that may streak down over other architectural elements. The water may freeze, causing the ice to crack the cast iron. Cracks reduce the strength of the total castiron assembly and provide another point of entry for water. Thus, it is important that cracks be made weathertight by using caulks or fillers, depending on the width of the crack. 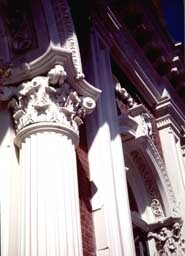 Fiberglass columns and aluminum capitals were installed to replicate the ornamental features on the east facade of the New Market Theater in Portland, Oregon. Photo: William J. Hawkins, III. Filler compounds containing iron particles in an epoxy resin binder can be used to patch superficial, nonstructural cracks and small defects in cast iron. The thermal expansion rate of epoxy resin alone is different from that of iron, requiring the addition of iron particles to ensure compatibility and to control shrinkage. Although the repaired piece of metal does not have the same strength as a homogeneous piece of iron, epoxy-repaired members do have some strength. Polyester-based putties, such as those used on auto bodies, are also acceptable fillers for small holes. In rare instances, major cracks can be repaired by brazing or welding with special nickel-alloy welding rods. Brazing or welding of cast iron is very difficult to carry out in the field and should be undertaken only by very experienced welders. In some cases, mechanical repairs can be made to cast iron using iron bars and screws or bolts. In extreme cases, deteriorated cast iron can be cut out and new cast iron spliced in place by welding or brazing. However, it is frequently less expensive to replace a deteriorated cast-iron section with a new casting rather than to splice or reinforce it. Cast-iron structural elements that have failed must either be reinforced with iron and steel or replaced entirely. The west facade of the New Market Theater retains its original cast iron features. Photo: George McMath. A wobbly cast-iron balustrade or railing can often be fixed by tightening all bolts and screws. Screws with stripped threads and seriously rusted bolts must be replaced. To compensate for corroded metal around the bolt or screw holes, new stainless steel bolts or screws with a larger diameter need to be used. In extreme cases, new holes may need to be tapped. The internal voids of balusters, newel posts, statuary, and other elements should not be filled with concrete; it is an inappropriate treatment that causes further problems. As the concrete cures, it shrinks, leaving a space between the concrete and cast iron. Water penetrating this space does not evaporate quickly, thus promoting further rusting. The corrosion of the iron is further accelerated by the alkaline nature of concrete. Where cast-iron elements have been previously filled with concrete, they need to be taken apart, the concrete and rust removed, and the interior surfaces primed and painted before the elements are reassembled. The replacement of cast-iron components is often the only practical solution when such features are missing, severely corroded, or damaged beyond repair, or where repairs would be only marginally useful in extending the functional life of an iron element. Sometimes it is possible to replace small, decorative, nonstructural elements using intact sections of the original as a casting pattern. For large sections, new patterns of wood or plastic made slightly larger in size than the original will need to be made in order to compensate for the shrinkage of the iron during casting (cast iron shrinks approximately 1/8 inch per foot as it cools from a liquid into a solid). Occasionally, a matching replacement can be obtained from the existing catalogs of iron foundries. Small elements can be custom cast in iron at small local foundries, often at a cost comparable to substitute materials. Large elements and complex patterns will usually require the skills and facilities of a larger firm that specializes in replication. 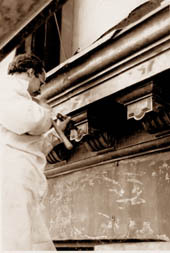 Architectural elements were traditionally cast in sand molds. The quality of the special sands used by foundries is extremely important; unlike most sands they must be moist. Foundries have their own formulas for sand and its admixtures, such as clay, which makes the sand cohesive even when the mold is turned upside down. A two-part mold (with a top and a bottom, or cope and drag) is used for making a casting with relief on both sides, whereas an open-top mold produces a flat surface on one side. For hollow elements, a third pattern and mold are required for the void. Many hollow castings are made of two or more parts that are later bolted, screwed, or welded together, because of the difficulty of supporting an interior core between the top and bottom sand molds during the casting process. The molding sand is compacted into flasks, or forms, around the pattern. The cope is then lifted off and the pattern is removed, leaving the imprint of the pattern in the small mold. Molten iron, heated to a temperature of approximately 2700 degrees Fahrenheit, is poured into the mold and then allowed to cool. The molds are then stripped from the casting; the tunnels to the mold (sprues) and risers that allowed release of air are cut off; and ragged edges (called "burrs") on the casting are ground smooth. The castings are shop-primed to prevent rust, and laid out and preassembled at the foundry to ensure proper alignment and fit. When parts do not fit, the pieces are machined to remove irregularities caused by burrs, or are rejected and recast until all of the cast elements fit together properly. Most larger pieces then are taken apart before shipping to the job site, while some small ornamental parts may be left assembled. It is sometimes necessary to dismantle all or part of a cast-iron structure during restoration, if repairs cannot be successfully carried out in place. 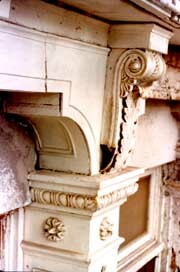 Dismantling should be done only under the direction of a preservation architect or architectural conservator who is experienced with historic cast iron. Extreme care must be taken since cast iron is very brittle, especially in cold weather. Dismantling should follow the reverse order of construction and re-erection should occur, as much as possible, in the exact order of original assembly. Each piece should be numbered and keyed to record drawings. When work must be carried out in cord weather, care needs to be taken to avoid fracturing the iron elements by uneven heating of the members. Both new castings and reused pieces should be painted with a shop-applied prime coat on all surfaces. All of the components should be laid out and preassembled to make sure that the alignment and fit are proper. Many of the original bolts, nuts, and screws may have to be replaced with similar fasteners of stainless steel. After assembly at the site, joints that were historically caulked should be filled with an architectural-grade polyurethane sealant or the traditional white lead paste. White lead has the advantage of longevity, although its use is restricted in many areas. In some instances, it may be necessary to design and install flashings to protect areas vulnerable to water penetration. Flashings need to be designed and fabricated carefully so that they are effective, as well as unobtrusive in appearance. The most durable material for flashing iron is terne-coated stainless steel. Other compatible materials are terne-coated steel and galvanized steel; however, these require more frequent maintenance and are less durable. Copper and lead-coated copper are not recommended for use as flashings in contact with cast iron because of galvanic corrosion problems. Galvanic problems can also occur with the use of aluminum if certain types of electrolytes are present. In recent years, a number of metallic and non-metallic materials have been used as substitutes for cast iron, although they were not used historically with cast iron. The most common have been aluminum, epoxies, reinforced polyester (fiberglass), and glass fiber-reinforced concrete (GFRC). Factors to consider in using substitute materials are addressed in Preservation Briefs 16, which emphasizes that "every means of repairing deteriorating historic materials or replacing them with identical materials should be examined before turning to substitute materials." Cast aluminum has been used recently as a substitute for cast iron, particularly for ornately-detailed decorative elements. Aluminum is lighter in weight, more resistant to corrosion, and less brittle than cast iron. However, because it is dissimilar from iron, its placement in contact with or near cast iron may result in galvanic corrosion, and thus should be avoided. Special care must be taken in the application of paint coatings, particularly in the field. It is often difficult to achieve a durable coating after the original finish has failed. Because aluminum is weaker than iron, careful analysis is required whenever aluminum is being considered as a replacement material for structural cast-iron elements. This lightweight fiberglass column at street level sustained damage from impact within a few years of installation. Photo: Building Conservation Associates. Epoxies are two-part, thermo-setting, resinous materials which can be molded into virtually any form. When molded, the epoxy is usually mixed with fillers such as sand, glass balloons, or stone chips. Since it is not a metal, galvanic corrosion does not occur. When mixed with sand or stone, it is often termed epoxy concrete or polymer concrete, a misnomer because no cementitious materials are included. Epoxies are particularly effective for replicating small, ornamental sections of cast iron. Since it is not a metal, galvanic action does not occur. Epoxy elements must have a protective coating to shield them from ultraviolet degradation. They are also flammable and cannot be used as substitutes for structural cast-iron elements. Reinforced polyester, commonly known as fiberglass, is often used as a lightweight substitute for historic materials, including cast iron, wood, and stone. In its most common form, fiberglass is a thin, rigid, laminate shell formed by pouring a polyester resin into a mold and then adding fiberglass for reinforcement. Like epoxies, fiberglass is non-corrosive, but is susceptible to ultraviolet degradation. Because of its rather flimsy nature, it cannot be used as a substitute for structural elements, cannot be assembled like cast iron and usually requires a separate anchorage system. It is unsuitable for locations where it is susceptible to damage by impact, and is also flammable. Glass fiber-reinforced concrete, known as GFRC, is similar to fiberglass except that a lightweight concrete is substituted for the resin. GFRC elements are generally fabricated as thin shell panels by spraying concrete into forms. Usually a separate framing and anchorage system is required. GFRC elements are lightweight, inexpensive, and weather resistant. Because GFRC has a low shrinkage coefficient, molds can be made directly from historic elements. However, GFRC is very different physically and chemically from iron. If used adjacent to iron, it causes corrosion of the iron and will have a different moisture absorption rate. Also, it is not possible to achieve the crisp detail that is characteristic of cast iron. A successful maintenance program is the key to the long-term preservation of architectural cast iron. Regular inspections and accurate record-keeping are essential. Biannual inspections, occurring ideally in the spring and fall, include the identification of major problems, such as missing elements and fractures, as well as minor items such as failed caulking, damaged paint, and surface dirt. Records should be kept in the form of a permanent maintenance log which describes routine maintenance tasks and records the date a problem is first noted, when it was corrected, and the treatment method. Painting records are important for selecting compatible paints for touch-up and subsequent repainting. The location of the work and the type, manufacturer, and color of the paint should be noted in the log. The same information also should be assembled and recorded for caulking. Superficial dirt can be washed off well-painted and caulked cast iron with low-pressure water. Non-ionic detergents may be used for the removal of heavy or tenacious dirt or stains, after testing to determine that they have no adverse effects on the painted surfaces. Thick grease deposits and residue can be removed by hand scraping. Water and detergents or non-caustic degreasing agents can be used to clean off the residue. Before repainting, oil and grease must be removed so that new coatings will adhere properly. The primary purpose of the maintenance program is to control corrosion. As soon as rusting is noted, it should be carefully removed and the protective coating of the iron renewed in the affected area. Replacement of deteriorated caulking, and repair or replacement of failed flashings are also important preventive maintenance measures. The successful conservation of cast-iron architectural elements and objects is dependent upon an accurate diagnosis of their condition and the problems affecting them, as well as the selection of appropriate repair, cleaning, and painting procedures. Frequently, it is necessary to undertake major repairs to individual elements and assemblies; in some cases badly damaged or missing components must be replicated. 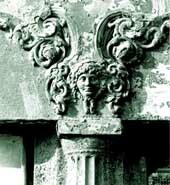 The long-term preservation of architectural cast iron is dependent upon both the undertaking of timely, appropriate repairs and the commitment to a regular schedule of maintenance. This Preservation Brief was developed by the New York Landmarks Conservancy's Technical Preservation Services Center under a cooperative agreement with the National Park Service's Technical Preservation Services, and with partial finding from the New York State Council on the Arts. The following individuals are to be thanked for their technical assistance: Robert Baird, Historical Arts and Casting; Willcox Dunn, Architect and Cast-Iron Consultant; William Foulks, Mesick Cohen Waite Architects; Elizabeth Frosch, New York City Landmarks Preservation Commission; William Hawkins, III, FAIA, McMath Hawkins Dortignacq; J. Scott Howell, Robinson Iron Company; Maurice Schicker, Facade Consultants International; Joel Schwartz, Schwartz and Schwartz Metalworks; and Diana Waite, Mount Ida Press. Kim Lovejoy was project coordinator and editor for the Conservancy; Charles Fisher was project coordinator and editor for the National Park Service. Ashurst, John, and Nicola Ashurst with Geoff Wallis and Dennis Toner. Practical Building Conservation: English Heritage Technical Handbook: Volume 4 Metals. Aldershot, Hants: Gower Technical Press, 1988. Badger, Daniel D., with a new introduction by Margot Gayle. Badger's Illustrated Catalogue of Cast lron Architecture. New York: Dover Publications, Inc., 1981; reprint of 1865 edition published by Baker and Godwin, Printers, New York. Gayle, Margot, and Edmund V. Gillon, Jr. Cast lron Architecture in New York: A Photogrnphic Survey. New York: Dover Publications Inc., 1974. Gayle, Margot, David W. Look, AIA, and John G. Waite. Metals in America's Historic Buildings: Part I. A Historical Survey of Metals: Part II. Deterioration and Methods of Preserving Metals. Washington, D.C.; Preservation Assistance Division, National Park Service, U.S. Department of the Interior, 1980. Hawkins, William John III. The Grand Era of Cast-Iron Architecture in Portland. Portland, Oregon: Binford and Mort, 1976. Howell, J. Scott. "Architectural Cast Iron: Design and Restoration," The Journal of the Association for Preservation Technology. Vol XIX, Number 3 (1987), pp. 5155. Park, Sharon C., AIA. Preservation Briefs 16: The Use of Substitute Materials on Historic Building Exteriors. Washington D. C.: Preservation Assistance Division, National Park Service, U. 5. Department of the Interior, 1988. Robertson, E. Graeme, and Joan Robertson. Cast-Iron Decoration: A World Survey. New York: Watson-Guptill Publications, 1977. Southworth, Susan and Michael. Ornamental Ironwork: An Illustrated Guide to Its Design, History, and Use in American Architecture. Boston: David R. Godine, 1978. Waite, Diana S. Ornamental Ironwork: Two Centuries of Craftsmanship in Albany and Troy, New York. Albany, NY: Mount Ida Press, 1990.